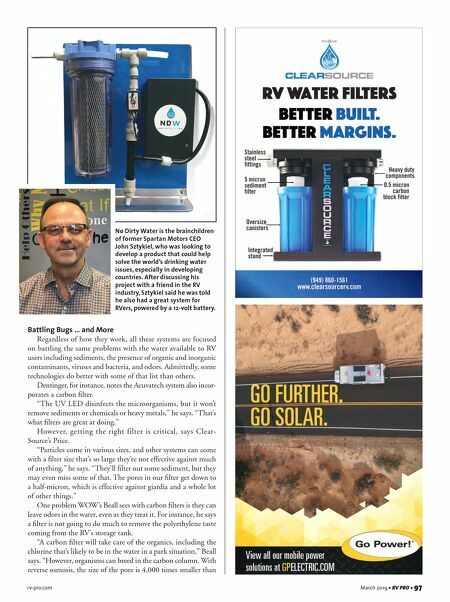 rv-pro.com March 2019 • RV PRO • 97 Battling Bugs … and More Regardless of how they work, all these systems are focused on battling the same problems with the water available to RV users including sediments, the presence of organic and inorganic contaminants, viruses and bacteria, and odors. Admittedly, some technologies do better with some of that list than others. Dentinger, for instance, notes the Acuvatech system also incor- porates a carbon filter. "The UV LED disinfects the microorganisms, but it won't remove sediments or chemicals or heavy metals," he says. "That's what filters are great at doing." However, getting the right filter is critical, says Clear- Source's Price. "Particles come in various sizes, and other systems can come with a filter size that's so large they're not effective against much of anything," he says. "They'll filter out some sediment, but they may even miss some of that. The pores in our filter get down to a half-micron, which is effective against giardia and a whole lot of other things." One problem WOW's Beall sees with carbon filters is they can leave odors in the water, even as they treat it. For instance, he says a filter is not going to do much to remove the polyethylene taste coming from the RV's storage tank. "A carbon filter will take care of the organics, including the chlorine that's likely to be in the water in a park situation," Beall says. "However, organisms can breed in the carbon column. With reverse osmosis, the size of the pore is 4,000 times smaller than No Dirty Water is the brainchildren of former Spartan Motors CEO John Sztykiel, who was looking to develop a product that could help solve the world's drinking water issues, especially in developing countries. 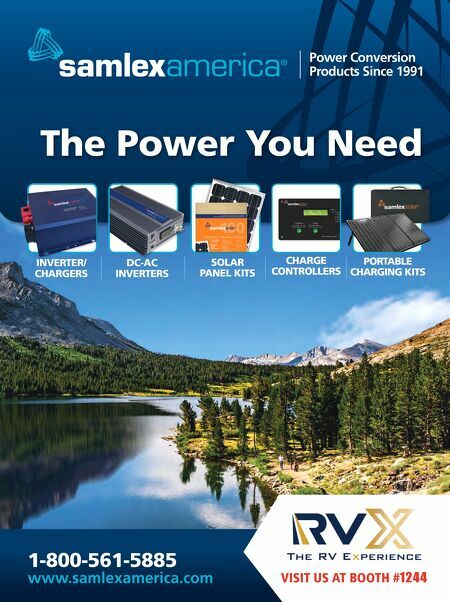 After discussing his project with a friend in the RV industry, Sztykiel said he was told he also had a great system for RVers, powered by a 12-volt battery.